O.K. Don’t explain to me what the NPR headline writer “really” meant just yet. Let me spend a few more minutes with that lovely image. Yes, I see it! Idaho Senator Jim Risch laid out while water is poured over a cloth covering his face until he confesses that he has no business being on the Senate Intelligence Committee. 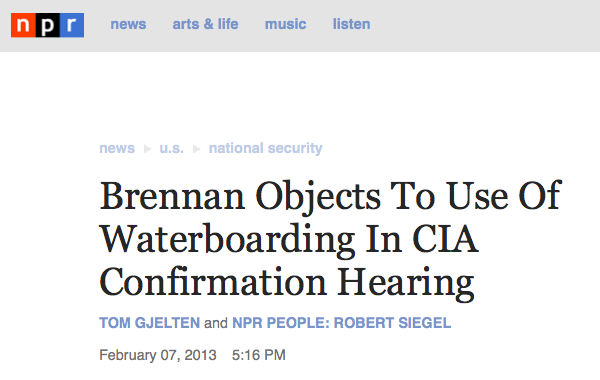 From the sidelines, John Brennan objects, claiming that, based upon his experience, water boarding is not an effective interrogation technique. Back to reality. Here, according to Charlie Pierce, is what really happened. They never laid a glove on him — not, I suspect, that many of them wanted to do so — and John Brennan looked very comfortable in front of the Senate Intelligence Committee during his extended job interview to become the head of the CIA. After all, they were all members of the national-security priesthood, one way or the other, and if they had to discuss their deadly private liturgies (in however cursory a fashion) in public (however briefly), well, that’s just the price of doing business. And if Senator Jim Risch felt the need to bluster about a leak, Brennan got to bluster back, so the call-and-response ritual of the liturgies was adhered to in public as it would have been in private. But there was about the hearing a feeling of pure show, because both sides were operating under a tacit agreement that there are things that the American people must not, and should not, know about what it being done in their name. Once that agreement is struck, once that private communion is joined, the fundamentals of self-government are left behind.